This is the start of a new series on interesting Nova Scotians. I hope you enjoy this first installment. All photos, except for recipe shots, courtesy of Jack and Joan. Jack Penney, a modern Renaissance man, believes in self sufficiency. He lives off the grid. He uses solar and wind for power, and heats and cooks with wood harvested from his property. He also raises sheep and free range hens. 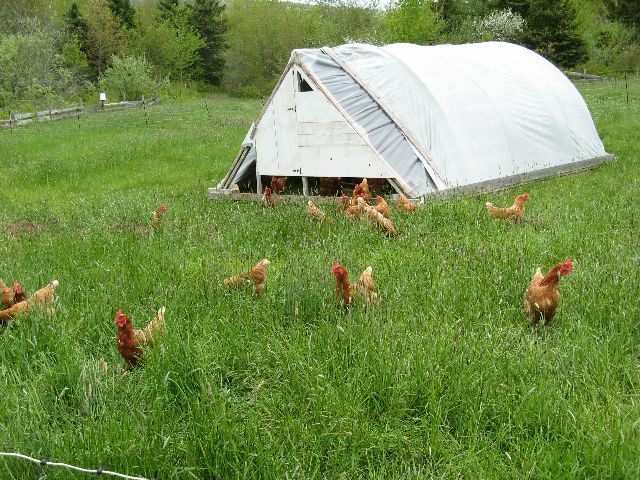 He rotates the hens and sheep on fresh pasture using a portable hen house and solar fencing. 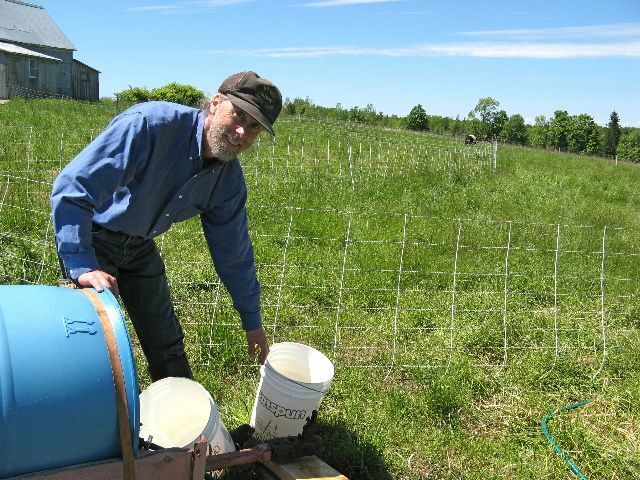 This rotation maintains the health of the fields while sustaining the animals. Jack has been influenced by two innovative farmers and authors: Joel Salatin, who has developed a grazing rotation system for chickens, cows and swine; and Eliot Coleman, an organic grower in Maine, USA who grows and harvests winter crops (mainly greens) in unheated greenhouses throughout the winter. Coleman is the author of Four Season Harvest and Winter Harvest. 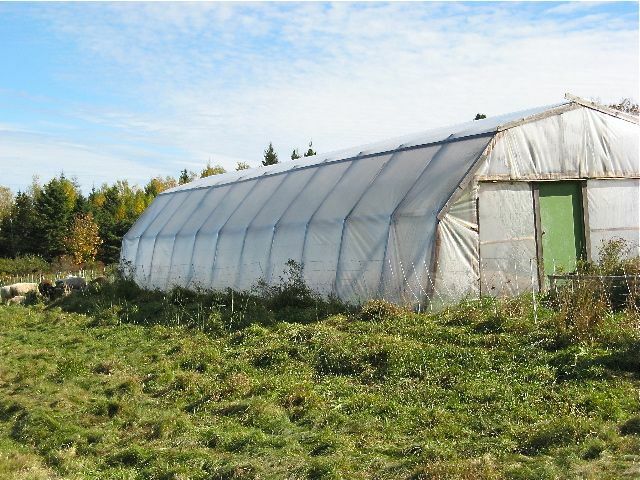 Being inspired by Four Season Harvest, Jack designed and built a 20' x 50' greenhouse from boards he milled and laminated himself. Jack is a sawyer by trade and owns a sawmill business with his father. The two selectively log their properties and produce custom lumber. The greenhouse was an experiment. Since the lumber was free he figured he didn't have much to lose. Jack's 20' x 50' greenhouse uses no heat other than the sun. The greenhouse is covered year round with greenhouse plastic. Jack grows tomatoes, cucumbers and strawberries during the summer months. Strawberries fruit in May (around the same time as rhubarb is ready – good for pie!) and tomatoes ripen in early July. Cold weather crops such as kale, spinach, arugula, broccoli rabe, carrots, beets, corn salad and lettuce seeds are planted the last week of August. They are planted early enough to germinate and become established (but not over mature) before the first hard frost. The plants go dormant and cease growing when the light and temperature drop as winter arrives. 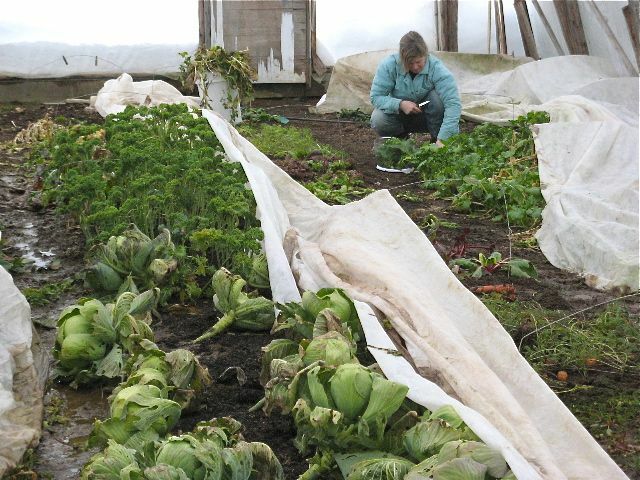 In autumn, when frost threatens, the vegetables are covered for protection. They remain that way through winter. The greens will freeze when temperatures dip down into the single digits in the greenhouse but will thaw unharmed and then can be harvested again. Joan harvesting. Note the snow up the sides outside. Jack and his partner Joan (a well known potter) have been harvesting cold weather greens all winter. The plants have now resumed growing since the beginning of March as temperatures climbed inside the greenhouse. Carrots and peas were planted on Sunday, March 20 in a balmy 18°C greenhouse (outside temperature was 3°C with a windchill dipping below 0°). They have been eating a great deal of kale lately. They either lightly steam the leaves by tossing with olive oil and crushed garlic (which infused as it heats on the stove top) or make kale chips by laying the leaves out on a cookie sheet, spraying with olive oil and baking at 350°F until crisp. They live happily from the land, which is rare in these days of instantaneous convenience. I'm sure their quality of life far surpasses that which many of us think we "enjoy." 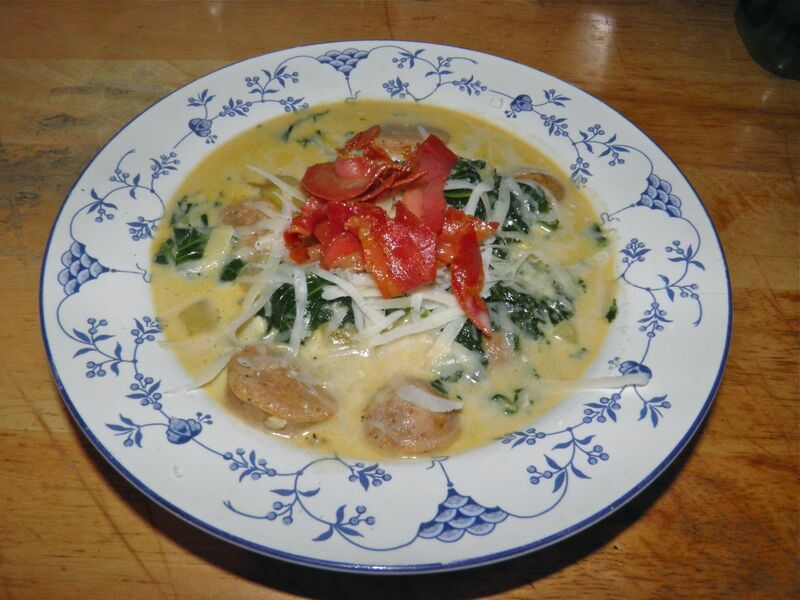 Here's a hearty country style recipe that uses some of that kale they have in abundance. It's very filling and is a nutritious complete meal. The only additions I would make would possibly be some crusty bread and a chilled beer. Place sausages in the bottom of a heavy saucepan or dutch oven. Add enough water to come up the sausages half way. Bring to a boil and allow to cook through, turning once. The water will be all evaporated when they are done. Remove the sausages and slice into bite sized pieces. Add the oil to the pan and then the pancetta. Let cook until the ham is crisp. 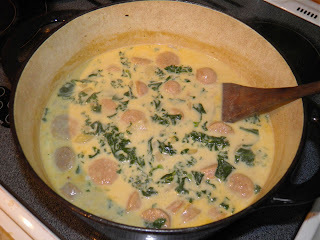 Remove and set aside in a different bowl from the sausage. Leave the rendered fat and oil that has collected in the pot. Add the onions to the pot and sauté until they are softened, about 3 minutes. Add the garlic and cook until fragrant, about 2 minutes. Do not let the garlic burn. Add the chicken stock and potatoes to the pot, bring to a boil, reduce heat and simmer for 15 minutes. 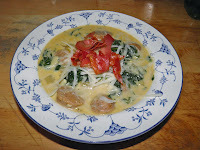 Add in the kale and sausage and cook for a further 10 minutes. Then add in the cream and reheat. Serve at the table with grated parmesan atop each bowl and the pancetta sprinkled on top. If you like this post retweet it using the link at top right, or share with any of the links below.